Hey there, I’m still alive! Things have just been really busy and I haven’t had time to post again until now. I’ve been working on my latest authored/illustrated middle grade novel, The Secrets to Ruling School: Class Election, and have had to put all of my energy into that in order to finish on time. I just wrapped on it last week so I can finally get back to posting on a more frequent basis. In fact, I’d like to take this post to talk about my experience working on the novel for those who might like more insight into that area of business. Writing and illustrating your own middle grade novel takes a lot of time. Unlike a lot of other projects, books don’t happen quickly. They take almost a year to get right. Frequently longer. It took me three months to write the first draft of The Secrets to Ruling School: Class Election. And by “first draft” I’m referring to the first draft that was submitted to the publisher, not the twelve previous drafts I wrote for myself to whip the book into shape. Then, of course, rewrites followed for a few more months afterward once I got editorial feedback, over which time I completely rewrote the book from the ground up and solidified the premise and story. Once the manuscript was approved, the art had to be created. At over two hundred illustrations scattered throughout, it took another three months to sketch out the book plus an extra two months to ink it. Additionally, as the author/illustrator, I was responsible for the cover art—another task which can tack on a few more weeks to the schedule. So, there’s quite a big time commitment that comes with creating your own middle grade book. Book advances vary from nonexistent to millions of dollars. For most author/illustrators, a typical advance is enough to make the book worth doing, but not so much you’re getting rich off of it. In fact, the advance most likely won’t be enough money for you to live off of for a year. Which means you basically have to have two jobs—the first one creating your book, and the second one the thing you do to pay the rest of the bills. So I had to continue to do my regular illustration and design work on top of my daily writing and drawing to meet my book deadlines. Needless to say, weekends were not part of my world for a while. One thing I had not expected when embarking on my book was just how large of a commitment book promotion would end up being. 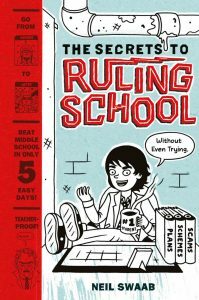 While writing The Secrets to Ruling School: Class Election, I was also in the midst of promoting the first book in the series, The Secrets to Ruling School (Without Even Trying) which had just come out the past September. That meant there were a lot of tasks to accomplish—a website had to be built; conferences had to be attended; school visits negotiated and planned; interviews given; signings coordinated; trailers made; blog posts written. It was an additional job on top of the two others I was already working. And, even then, I wish I’d had more time to promote. It’s definitely something I’m going to rectify with the new book now that I have more free hours on my hands. You can never have enough promotion. Yes, creating my own authored/illustrated middle grade book took an unbelievable amount of blood, sweat, and tears, but it was all worth it. I’ve received adoring fan mail; turned reluctant readers into book enthusiasts; met tons of cool kids, teachers, and librarians; and birthed something into the world that never would have existed previously. And, career-wise, it’s been fulfilling to work on something whose success or failure is all mine to achieve. And that’s something that every illustrator should attempt at least once in their career. 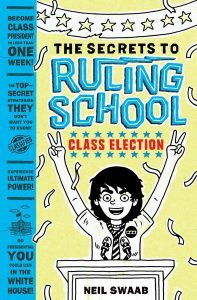 For anyone interested, The Secrets to Ruling School: Class Election comes out September 13, 2016 from Amulet Books and is available for pre-order now.